A hot, smoky year is drawing to a close as government representatives from 190 countries meet in early December for the 24th UN Climate Change Conference in Katowice, Poland. Their aim is to adopt a package of measures and uniform rules that will make it possible to achieve the target set at the Paris 2015 climate summit. The objective of this agreement is to limit global warming to well below two degrees Celsius. And given the extreme weather we have experienced this year, this appears more urgent than ever. Nearly every corner of the world was ravaged by hot, dry conditions in 2018 – even Japan, where people died as a result of excessive temperatures. Around the Arctic Circle, where fires had been rare prior to this, forests burned from Greenland to Alaska. And in Germany and many other countries in Northern and Central Europe, months of dry conditions led to crop failures and hundreds of millions of euros in losses. "The Earth has already warmed by one degree Celsius. If emissions continue unchecked, we will see a temperature increase of at least four degrees Celsius by the end of this century," says Hans-Otto Pörtner. A climate researcher at the Alfred Wegener Institute, Helmholtz Centre for Polar and Marine Research (AWI), Pörtner is the co-chair of Working Group II of the Intergovernmental Panel on Climate Change (IPCC) and one of the leading members of the expert panel. In his opinion, the cuts to emissions promised thus far by the signatories of the Paris Agreement are insufficient: "They will only enable us to limit warming to three degrees Celsius," Pörtner says. Climate researchers are therefore examining a much more ambitious idea: Could the Earth be cooled using artificial means? There is even a technical term for such hypothetical approaches already: Large-scale technical interventions that seek to impact our climate are referred to as "climate engineering" (CE). 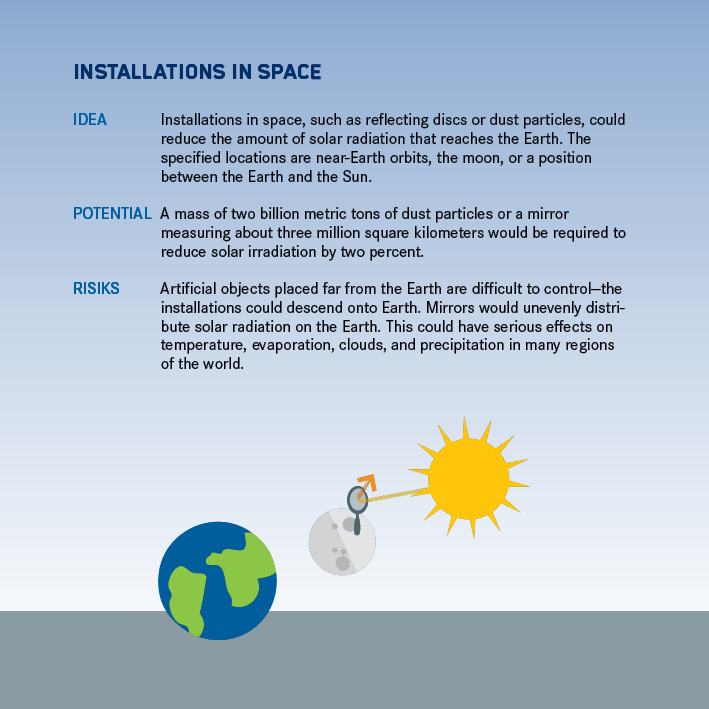 Proposed methods in this area can be divided into two approaches: The first aims to reflect a large portion of the Sun’s light back into space before it reaches the Earth’s surface—these methods are known as "solar radiation management". The second focuses on permanently removing the greenhouse gas carbon dioxide (CO2) from the atmosphere. 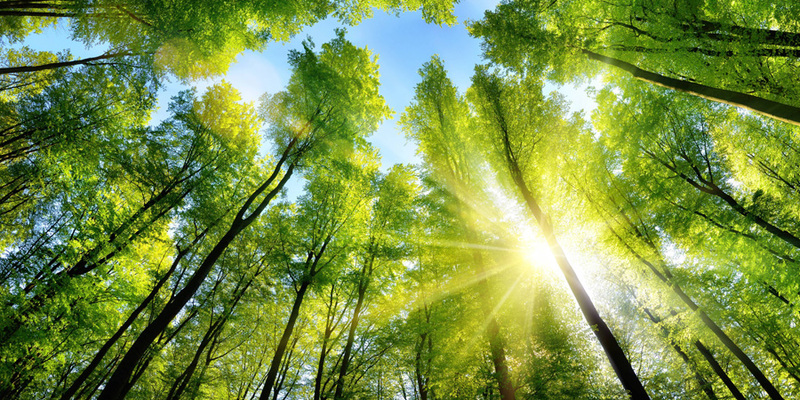 These methods are grouped together under the term "carbon dioxide removal" (CDR). The IPCC also refers to them as "negative emission technologies." "The more closely we analyze these procedures, the further their potential shrinks and the more risks are revealed." 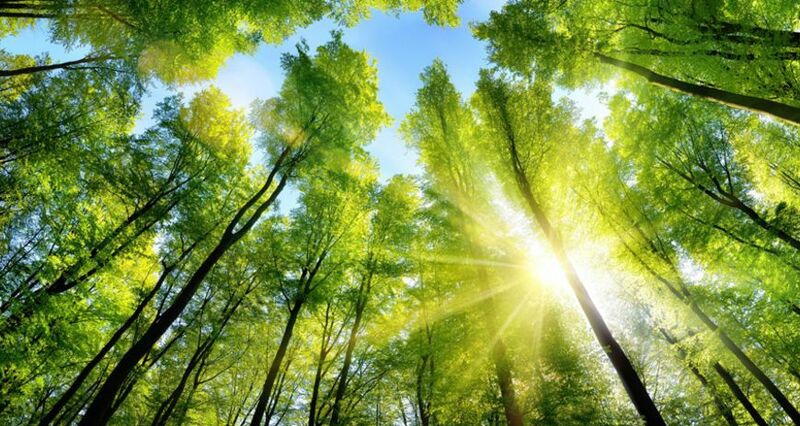 There is one fundamental difference between the two approaches: "When we remove carbon dioxide from the atmosphere, we reduce the concentration of this greenhouse gas, which is responsible for global warming," says Wilfried Rickels of the Kiel Institute for the World Economy. "With radiation management, on the other hand, we primarily limit the extent of warming and influence the concentration of CO2 in an indirect way only." Rickels is one of the leading researchers in the German Research Foundation’s "Climate Engineering" priority program. This program is the largest interdisciplinary research project to address this topic and is coordinated by the GEOMAR Helmholtz Centre for Ocean Research Kiel. Since 2003, the participating researchers from the fields of natural, social, and legal sciences as well as economics have been studying the opportunities and risks that various CE methods pose and the impact they could have on society. Rickels describes one of their key findings as follows: "The more closely we analyze these procedures, the further their potential shrinks and the more risks are revealed – the same applies to supposedly green methods such as reforestation or the cultivation of bioenergy crops." This is because both methods require one thing above all: land. 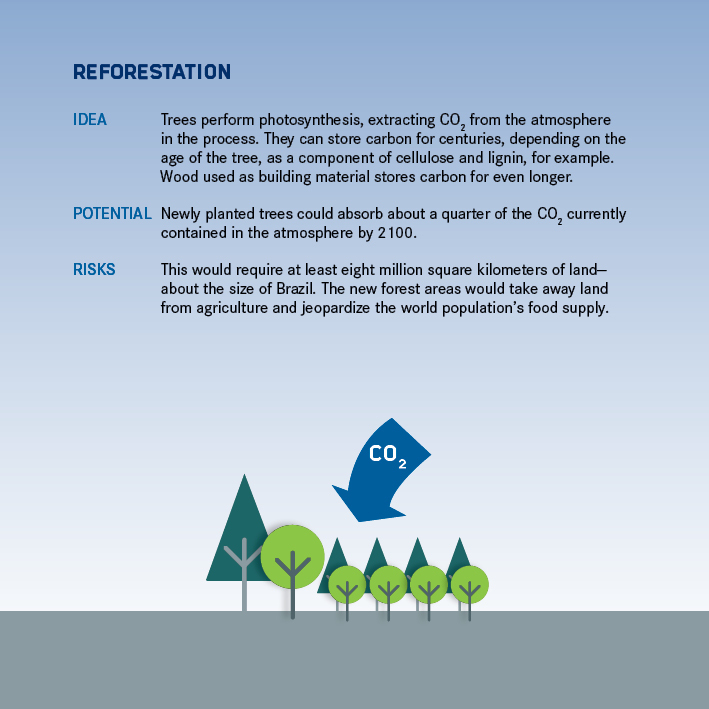 In order to sequester around a quarter of the CO2 contained in the atmosphere by 2100, a surface the size of Brazil would need to be reforested. This would mean the land could no longer be used to grow grain or graze livestock. In other words, there would be less food, which is a problematic scenario in light of the world’s growing population. 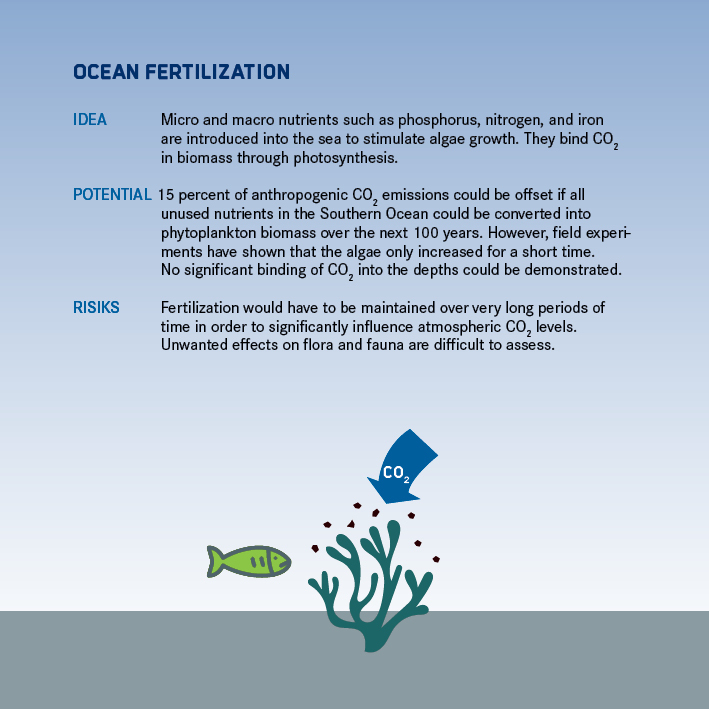 Could carbon dioxide perhaps be stored in the ocean? Some 20 to 25 percent of the carbon dioxide released by humans is absorbed by the world’s seas, where it undergoes chemical changes in the water. 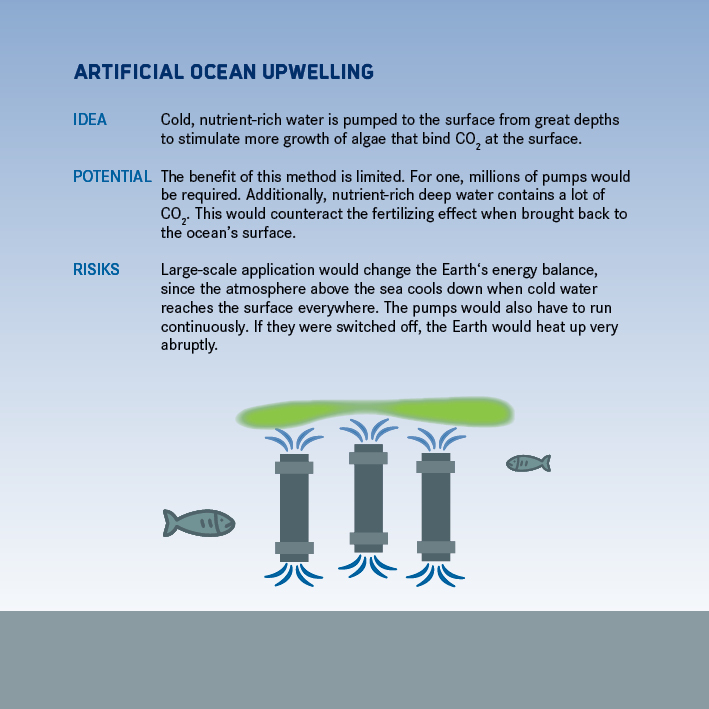 The CO2 then reacts with components of dissolved minerals that have been washed from the land into the ocean, for instance, and is permanently bonded in the water. One conceivable scenario, therefore, would be to distribute large quantities of powdered rock in the ocean in order to artificially induce this reaction. "Numerous experiments point to this method’s potential. However, like many other methods, the details of an application still need to be examined in field studies," says Jens Hartmann, a geologist specializing in hydrochemistry at the University of Hamburg. 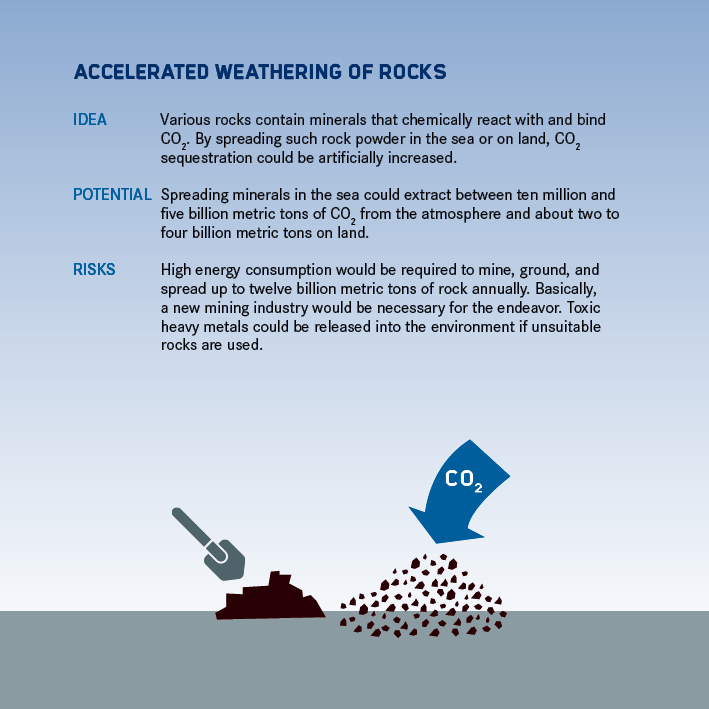 Researchers also believe that the greatest possible effect could only be achieved using specially prepared rock products, such as substances made from limestone or basalt. Producing a sufficient quantity of these substances would require mining operations on a scale similar to that of coal mining today. Hauke Schmidt is researching a different method of halting global warming. Schmidt, a climate modeler at the Max Planck Institute for Meteorology in Hamburg, analyzes volcanic eruptions. Millions of metric tons of the sulfur compound sulfate are launched as far as the stratosphere during such eruptions. 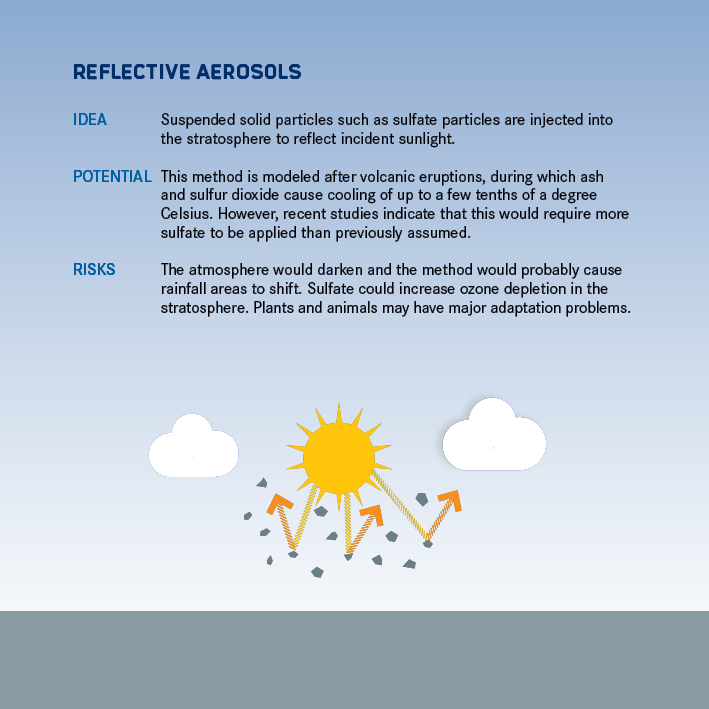 The particles of ash then act like tiny mirrors that reflect the incoming sunlight and prevent the Earth from warming. "Based on these natural experiments, we know that the Earth could be cooled by deploying reflective particles," says Schmidt. "But the quantities that would be required to achieve a certain effect are unclear. Our models still contain too much uncertainty to determine this, because we still don’t know enough about the microphysics of the particles or the way they interact with atmospheric circulation." Hans-Otto Pörtner believes there is potential in what is known as the direct air capture process. 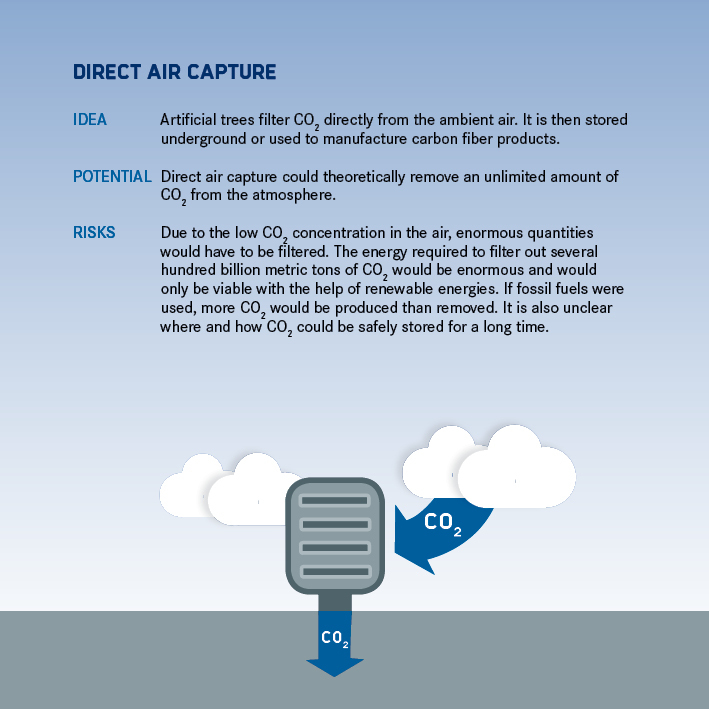 In this method, air is routed over special binders in order to filter out carbon dioxide, which is then stored or undergoes further industrial processing. Test facilities are already in use, and the cost of extracting one metric ton of CO2 has now fallen from 600 US dollars to between 100 and 230 US dollars thanks to technological progress. 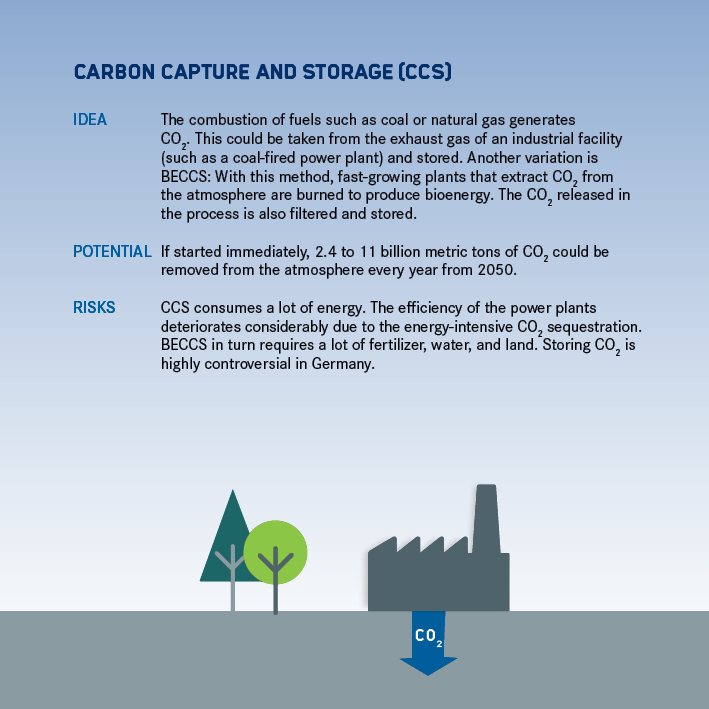 "You could say that Germany and its chemical industry are in a perfect position to further develop processes aimed at directly extracting CO2 from the air and recycling it in the form of synthetic fuels in conjunction with wind or solar energy. This would help, for example, to make shipping and aviation less dependent on fossil fuels and also incorporate these two problematic areas into efforts to protect the climate," says Pörtner. 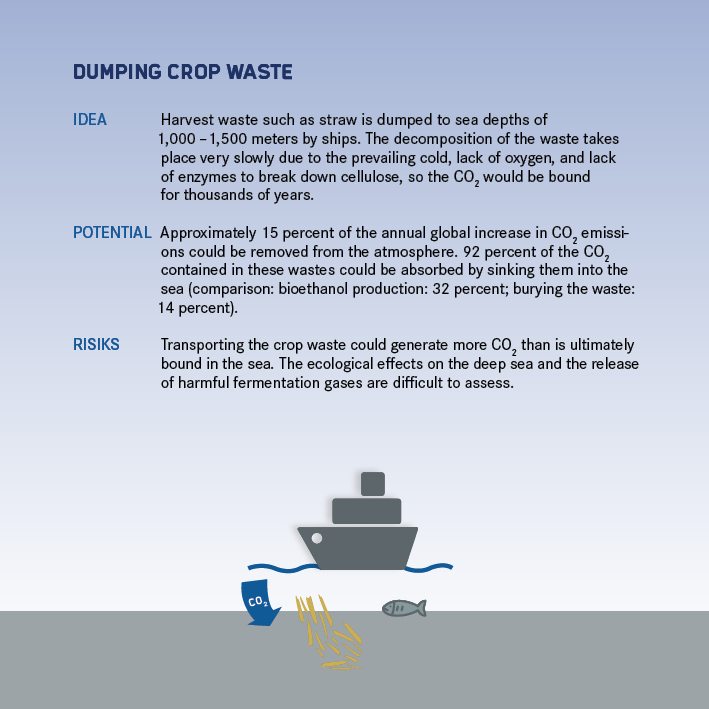 "The availability of CDR methods could cause people to lessen their efforts to avoid emissions." 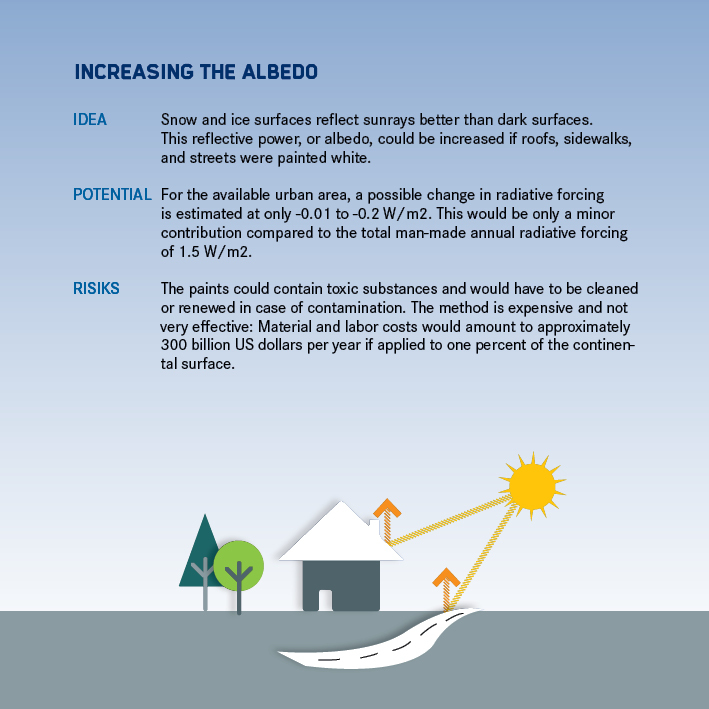 But the option of climate engineering could also send a fatal signal and dissuade the population from taking steps to protect the climate themselves. As part of a study, researchers in Kiel provided people with information on the extent of climate change and then asked them how much money they would personally invest in reducing emissions. Some of the participants also received information on BECCS (bioenergy with carbon capture and storage) as a supplementary technology that would support efforts to achieve the two-degree goal. Respondents in this group subsequently showed less willingness to spend money on climate protection than participants who had instead received more information on climate change. "In other words, the availability of CDR methods could cause people to lessen their efforts to avoid emissions," says Christine Merk of the Kiel Institute for the World Economy. Such a development would be a step in the wrong direction, as demonstrated by a new CE study led by Mark Lawrence at the Institute for Advanced Sustainability Studies (IASS) in Potsdam. "Even if we were to make the decision today to use CE methods, it would be several decades before the various technologies were ready to be applied at a scale sufficient to impact the climate," the researcher says. He notes that humankind must first address the task of conducting further research into the individual methods – and, if the decision is indeed made to apply a particular technology, set up facilities on a vast scale. Furthermore, there is a political aspect that needs be considered, especially in the case of solar radiation management: According to Lawrence, it would take a very long time to develop appropriate legal frameworks and coordinate deployment plans at the international level. Until then, he says, only one option remains: drastically reducing all types of CO2 emissions. This article was first published in our magazine Helmholtz Perspektiven 04/2018. Debating Project "Die Debatte - Geoengineering"